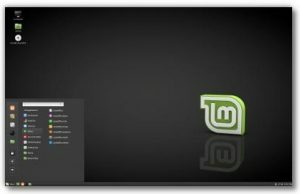 Switch to Linux Mint, a secure, reliable operating system - PC Buyer Beware! Linux Mint 18.1 Serena desktop. Click on the image to view its full size. During my investigations into computer problems, I came across reviews recommending the Linux Mint operating system (Wikipedia page) as a Linux distro that works out of the box. Ideal for Windows users who don’t like the way that Microsoft is invading their privacy, starting with Windows 8 and increasing in Windows 10, and who don’t want to waste time configuring Linux. More good news is that from Linux Mint 18.1 “Serena” it becomes possible for automatic updates to take place. For more information, read the following article. The best Linux desktop just got even better. I have a laptop dating back to 2007 that originally ran Windows XP SP3. It is now a dual-boot Windows XP/Windows 10 system, having also run Vista, Windows 7, Windows 8.1 well. A lot of the software I use in Windows XP won’t install in Windows 10. The 32-bit version of WinXP, using 2GB of RAM memory, was working slowly and playing up. This made me want to try using Linux on the laptop. I was going to try Ubuntu Linux, but reviews convinced me that Linux Mint was the best choice. The default web browser for Linux Mint is Mozilla Firefox, which no longer updates. The good news is that the superior Opera browser is available for Linux and can be made to install updates. The following webpage provides the installation instructions. Opera now comes with a free Virtual Private Network (VPN) that increases security by giving the IP address of the VPN instead of the one given to your browsing by your Internet Service Provider (ISP). Linux Mint works in much the same way as Windows XP/7/10. Its Update Manager is the equivalent of Windows Update. The (start) Menu, shown below, provides access to categories of software, hardware or files. Placing the mouse pointer over a category expands it. Examples are: Menu => Backup Tool; Administration => Software Manager; Administration => Printers; Places => Downloads. The Firefox web browser places its downloads there. 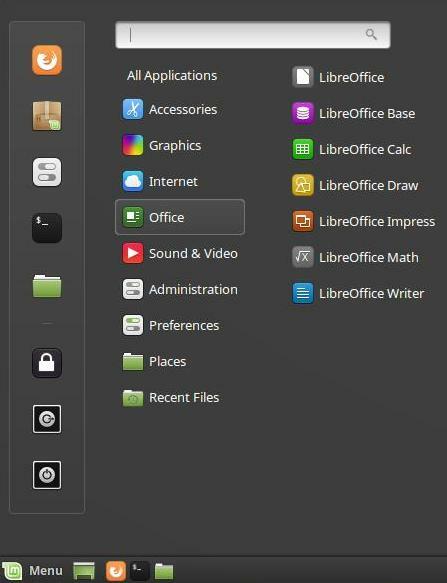 The Menu, shown below, is showing the Office => LibreOffice options. 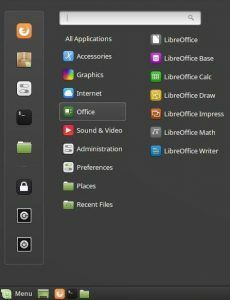 Linux Mint comes with plenty of preinstalled software – the LibreOffice office suite, the GIMP image editor, the VLC media player and the Firefox web browser. Therefore, most users are at home as soon as they boot into Linux Mint. 18.1 “Serena” was the latest version in March 2017. The Software Manager provides access to a massive range of free software that is rated up to five stars by users. You can even run Windows software in any distro of Linux by using Wine. As already mentioned, the Software Manager gives access to plenty of all kinds of free Linux-based software. Wine was at the top of the list, so all I had to do was choose to install it. You have to enter your password to do everything of an administrative nature. Moreover, there is a Lock icon in the Menu that locks Mint. That improves security, so it’s fine by me. I connected my 12-year-old HP printer/scanner/copier and it detected it and installed the device driver. A tool called Simple-scan makes the scanner work. If you press the Prt Sc key to take screenshots, it places them in the Menu => Places => Pictures folder by default, but you can choose to put them in any other folder. To save a screenshot in Windows you would have to open Paint and paste the image into it and then save the image in the format of your choice. If you want to edit images or screenshots, just fire up the powerful GIMP image viewer and editor. There are plenty of online tutorials and YouTube video tutorials on how to use it. Much better than forking out a fortune for Photoshop. Or use Wine to install IrfanView, which is what I use to edit the images on this website. To switch off, restart, etc., clicking on the lowest power button brings up all of the options – Suspend – Hibernate – Restart – Cancel – Shut Down. The upper power button provides the Switch User and Log Out options. It shouldn’t take any experienced Windows user long to explore and adapt to this very user-friendly operating system. If you don’t want a replacement for Windows. if you have the free disk space, installing Linux Mint gives you an additional operating system to use that has plenty of diagnostic tools should Windows fail for some reason. It installs its boot menu that gives access to it and to Windows. If you access the Files folder by clicking on its shortcut on the taskbar, you gain access to all of the files in Mint as well as all of the files in the version of Windows. For example, if you have a dual-boot Windows 10/Linux system and Windows 10 fails to boot and no recovery option works to restore it and you have not created a recent, restorable backup or system image, if the Windows files are still intact, you might be able to use Mint to make copies of them. Linux Mint 18.1 Serena was the latest version in March 2017. 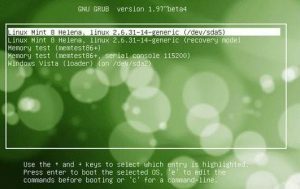 As with Ubuntu Linux, on which Mint is based, it is possible to run the operating system from its boot installation disc without installing it or you can install it. The installation disc makes a good recovery/repair disc. Mint provides plenty of recovery tools. If your computer has 4GB or less of RAM memory, it’s advisable to choose the 32-bit version of the four desktops. If your computer has more than 4GB of memory, download the 64-bit version, because a 32-bit version can only use 3.2GB of memory. When you have the ISO image in a folder, if your computer has an internal or external CD/DVD drive, you can use a DVD-burning tool to burn it to a DVD disc. I use the free CDBurnerXP. This is the best method. You need a different tool to make an ISO file bootable from a USB flash drive. There are many such tools. I use the free Rufus. Of course, you have to use a flash drive that has a larger free capacity than the download of 1.64GB. The User Guide advises to verify the download, but that is not necessary. The installation setup provides that option. Just use the verification followed by the the Install option and then follow the setup through to the end. The installation method in the User Guide is to choose the “Start Linux Mint” option that makes it operate from the disc. Mint works far more slowly from its disc than from an installation on the hard drive or SSD. You can play around with the operating system as much as you like. If you want to install it, double-click on the “Install Linux Mint” icon on the desktop. I had no problems on a laptop that is 10 years old. Just don’t be tempted to do anything other than allow the setup to proceed if you see a black screen for quite long periods. Mint creates a startup boot menu that includes options to boot Mint, open the Advanced option, run Memtest86 or boot from Windows if it is installed. The Advanced choice provides the recovery mode that is similar to Safe Mode in Windows. Memtest86 runs RAM memory tests. The image below shows the boot menu of Linux Mint 8 Helena with Windows Vista as a boot option. In this version, the recovery mode is an option on its own. In Mint 18.1 Serena, it is under the “Advanced options for Linux Mint 18.1 Cinnamon 32-bit” for the 32-bit version. Linux Mint 8 Helena boot menu. Click on the image to view its full size. Note that the Terminal option within Linux Mint is the command-line prompt that is the equivalent of the MS DOS Command Prompt in Windows. The setup asks if you want to install Mint alongside your existing installation(s) of Windows or delete them and install Mint. It’s best to choose alongside Windows. When you look under Computer in Windows, you’ll see that Mint has been installed on its own partition. In my case, there was unallocated space on the hard drive that was used. The image below of Disk Management in Windows shows what happened. The two new partitions with unnamed file systems and 1.99GB and 199.21GB capacities, both of which are shown as 100% free, which can’t be the case. The reason probably being that Windows can’t read the information created by Mint. Most computers bought new running Windows 8/8.1/10 have a UEFI BIOS. If your computer uses a UEFI BIOS with the Secure Boot setting enabled, this might block booting with the Linux Mint boot installation disk or USB flash drive that you create from the ISO image. The following article says that version 17 gave no boot problems with Secure Boot enabled. But if you have a boot problem with the DVD or flash drive set as the first boot device in the UEFI, which must be the case to boot from either of them, try disabling the Secure Boot setting. February 25, 2018 in News, Reviews, Software Problems.